To the south are the Abberley Hills, including Woodbury Hill, with an ancient hill fort on its summit. Apprenticeship registers 1808-22; Apprenticeship indentures 18th & 19th centuries. 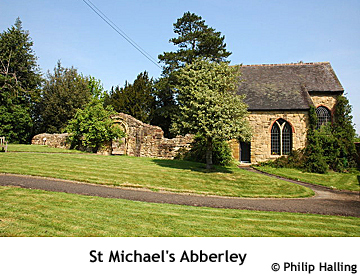 ABBERLEY, a parish in the lower division of the hundred of DODDINGTREE, county of WORCESTER, 4¾ miles (W. S. W.) from Stourport, containing 574 inhabitants. The living is a rectory, in the archdeaconry of Salop, and diocese of Hereford, rated in the king's books at £11. 10. 2½ , and in the patronage of R. Bromley, Esq. The church is dedicated to St. Michael. 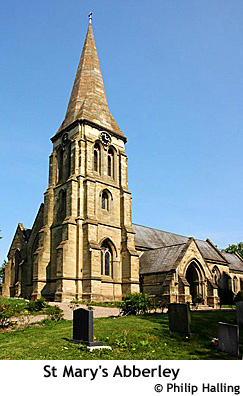 The village of Abberley is situated in a valley to the right of the road leading from Worcester to Ludlow. The summits of the surrounding hills afford delightful prospects, and on the declivities are fine sheep-walks and thriving plantations. Coal of excellent "quality, and some limestone, are found in the neighbourhood. A court leet is held annually. A charity school is supported by the daughters of Col. Bromley. William Walsh, the poet, and a correspondent of Pope and Addison, was born here, in 1663.